When it comes to getting things done, I’m a big advocate for creating attainable goals to avoid overwhelm and keep moving forward. …but what is an attainable goal? I remember the first time I went to a gym. I wanted to get fit and was all revved up to burn some calories. After looking at all the machines in the room… I froze. After doing some research and speaking with the gym staff, I understood that to achieve my goal of “getting fit” I needed a workout plan and a healthy diet. A plan includes several exercises and each exercise is an attainable goal. Something that you can measure, start and finish. …like doing 20 push-ups, or running for 20 minutes. Last year, when I decided to create a children’s book, I found myself with the exact same feelings I had the first time I went to a gym. Where should I start? That is as vague as “going to get fit”. It’s not an action, it’s an end goal that requires a lot of steps to get there. So what can we do? 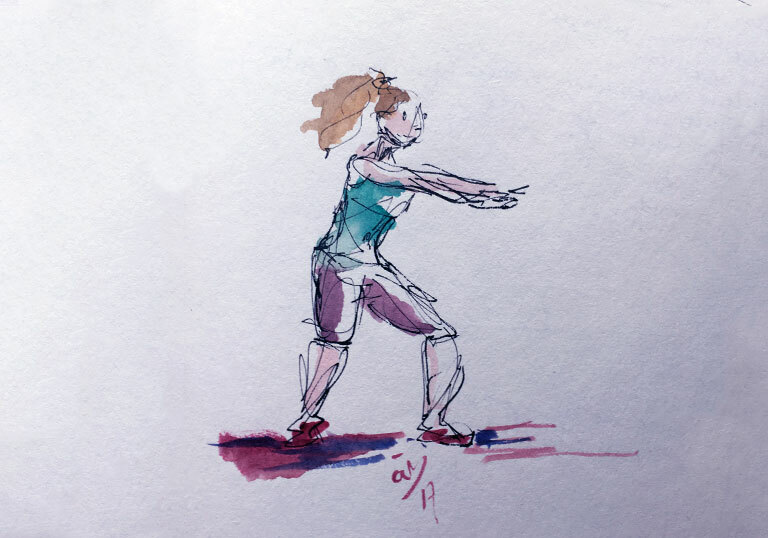 We can jump into drawing or writing, but again, that’s as vague as creating a workout plan or starting a healthy diet. There’s no actionable, measurable action to take. What if, instead, we sat down for 2 hours to write a description of our characters, or solidify the message we want to convey with our story? What if we created 50 thumbnails for a page spread we want to draw? …wouldn’t that be less overwhelming? It’s hard to start, but once take that first step, however small, things get easier. What is your next achievable goal? Totally! Also, I feel like people think that the first day they have to sit down and start the first step. In reality, the first thing you do is figure out what the steps Are. So day one (two, three… seventeen…) of my project, I’m actually organizing, making lists, researching and figuring out where to start. Only after that can I know what step one is and what goals I need to set. When you say day seventeen of your project: why the 17th? Is that a check in point for you to re-access what you’ve been workin on? Curious to know more! Thanks so much for your thoughtful comment 🙂 you’re the BEST! That is great advice! Quantifiable goals, with definitive outcomes… it can be applied to art, too! Totally, Jennifer! I believe we can apply to everything. I apply this to my Japanese studies as well. ‘Study one module, copy one story from the book…’.